Your outdoor gourmet kitchen awaits with the addition of the Napoleon Built-in LEX 605 Grill Head. This grill head will allow you to entertain well after dark with the stylish backlit control knobs. Napoleon’s JETFIRE ignition system makes sure that your grill lights every time by shooting a jet of flame to light the burners. Save money by cooking outdoors all summer long, keeping the oven off will help you keep the house cool. With a grill that behaves just like an oven you can easily bake and roast just like you would indoors. Sear quickly over the integrated infrared bottom burner. Add the optional charcoal tray for even more grilling fun. 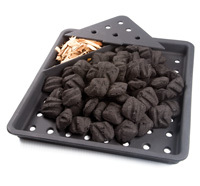 You can even turn the grill into a smoker by adding wood chips to the charcoal tray or using the Napoleon Smoker Tube. Cook all of your favourite foods on a grill that fits perfectly in to your ideal outdoor kitchen. With the Naploeon Cast Iron Charcoal and smoker tray you can turn your Napoleon LEX Gas BBQ into a Charcoal grill and smoker to enhanced your foods flavor.